Raspberries have been cultivated since the Middle Ages and are cousins to wild raspberries which come from Southern Europe. 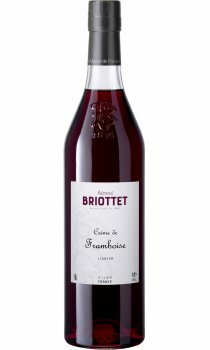 These bright red berries have a sweet but sharp taste, remarkably restored by Briottet's maceration manufacturing process. Creme de Framboise is served pure as a digestif or mixed with white wines, cremants and champagnes as an aperitif or cocktail, or can be used to pour over desserts. Add to ice cold champagne for a decadent treat.